Winter weather may not have hit northeastern Pennsylvania yet, but nature’s outdoor radiance of fall has transformed into the seasonal bland browns and mauves. Yet, if you look closely, some color remains. 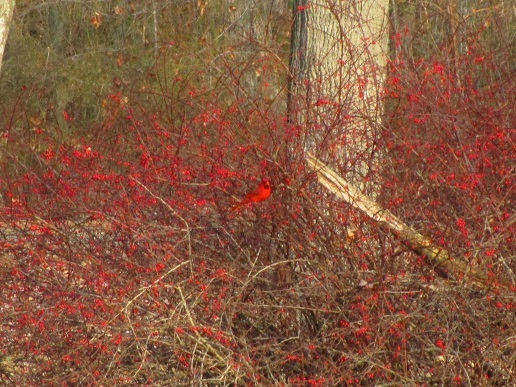 This cardinal sits within the bushes where only red berries remain. I wonder…is it trying to hide? Unfortunately, it’s brilliant red cannot be hidden, even among a similar colored backdrop. So it is with us. We each hold brilliant gifts…maybe the gift of laughter…love… hope…the list goes on and on. Like the cardinal, we cannot hide our unique gifts and we must be who we are. Can you imagine a world without the vibrant red color of a cardinal? I can’t. Don’t hide your gifts. If you’re not sure what your gifts are, dare to be your authentic self. That’s the best gift of all.